Proposalcrypt Ransomware is a dangerous infection that will not allow you to operate your computer properly once it enters your system. It might seem that there is no way out of this situation, but you can always remove Proposalcrypt Ransomware from your computer with a powerful antispyware tool. What’s more, it seems that there is no need to purchase the decryption tool from the cyber criminals because this infection is still underdeveloped, and it is possible to decrypt your files with public decryption tools. Therefore, do all you can to get rid of this infection, and restore your files using all the measures available. Of course, the best way to restore your files would be transferring them back from an external hard drive. Or perhaps you have some cloud storage where you save the most recent copies of your files? Whatever it might be, having a file backup is extremely important, because you can never know when you would get infected with ransomware and other dangerous programs that could wipe out your hard drive. However, remember that you should copy the healthy files back to your computer ONLY when you have Proposalcrypt Ransomware removed for good. Do not transfer the files while the ransomware is still on-board because it could encrypt the healthy files, too. Quite a few users manage to avoid ransomware infections because they recognize potential security risks and steer clear of them. 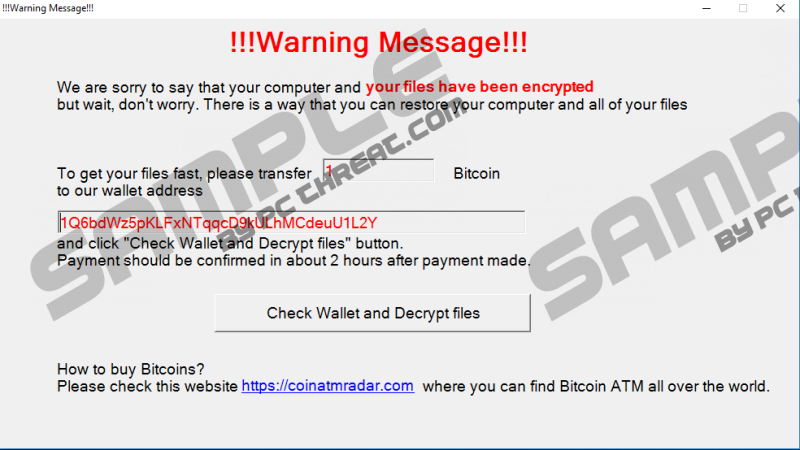 For example, Proposalcrypt Ransomware is distributed via spam email attachments, so it is important to recognize suspicious email messages and refrain from downloading the attached files. The malicious file that installs Proposalcrypt Ransomware on your computer looks like an MS Word document, so it might come with a message that pretends to be an invoice or some report from a financial institution. Please note that legitimate companies seldom send important information in file attachments. Also, the constant urge to open the file could also point out the potential scam. Research suggests that so far no amount of Bitcoins was transferred to the given Bitcoin wallet address. This means that either Proposalcrypt Ransomware has not spread wide, or users have found other ways to restore their files. The second variant is far more likely because computer security experts claim the infection can be decrypted. For that, you should refer to a security professional or websites that deal with ransomware issues face to face. Either way, it is more than obvious that this program is not as dangerous as it seems, so there is no need to panic if its ransom note pops up on your screen. We have identified the installer file as proposal.doc.exe in this description, but it should be pointed out that the filename could be different from computer to computer. Therefore, when you get down to removing Proposalcrypt Ransomware, you should look out for the double extension file, rather than looking for the filename itself. In the instructions below, you will find all the potential directories where the file could be hidden. However, the best way to get rid of malware is to use an automated computer security tool. Then you can be sure that not a single cyber stone will be left unturned. Delete the .doc.exe file from the Desktop. Open the Downloads folder and delete the .doc.exe file. Remove the .doc.exe file from the directory. Quick & tested solution for Proposalcrypt Ransomware removal.